NEW YORK (TheStreet) -- Origin Agritech Limited (SEED spiked to a one-year high of $3.47 on Wednesday on higher-than-normal volume. China's leading agricultural biotechnology company increased slightly throughout the last month until Wednesday, when the stock suddenly surged more than 35%. Origin Agritech Limited amassed a volume of 4,309,378, more than seven times its average of 592,535. It has a one-year low of $1.17 and hit a low of $2.51 for the day. 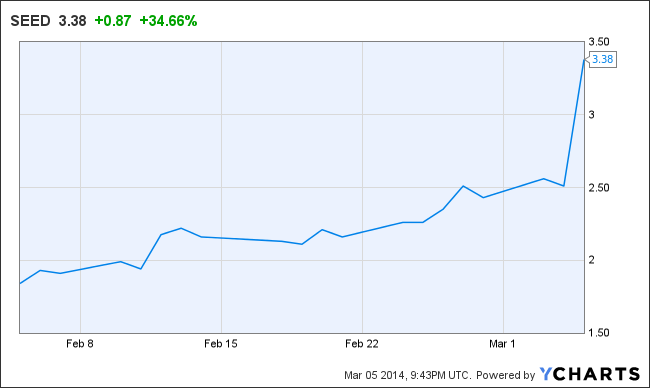 The stock closed at $3.37, up 86 cents or 34.26% from its previous close of $2.51. "We rate ORIGIN AGRITECH LTD (SEED) a SELL. This is driven by a number of negative factors, which we believe should have a greater impact than any strengths, and could make it more difficult for investors to achieve positive results compared to most of the stocks we cover. The company's weaknesses can be seen in multiple areas, such as its deteriorating net income, generally high debt management risk and disappointing return on equity." The company, on the basis of change in net income from the same quarter one year ago, has significantly underperformed when compared to that of the S&P 500 and the Food Products industry. The net income has significantly decreased by 38.9% when compared to the same quarter one year ago, falling from -$3.69 million to -$5.13 million. The debt-to-equity ratio of 1.39 is relatively high when compared with the industry average, suggesting a need for better debt level management. Along with this, the company manages to maintain a quick ratio of 0.15, which clearly demonstrates the inability to cover short-term cash needs. The company's current return on equity has slightly decreased from the same quarter one year prior. This implies a minor weakness in the organization. Compared to other companies in the Food Products industry and the overall market, ORIGIN AGRITECH LTD's return on equity significantly trails that of both the industry average and the S&P 500. 49.36% is the gross profit margin for ORIGIN AGRITECH LTD which we consider to be strong. Regardless of SEED's high profit margin, it has managed to decrease from the same period last year. Despite the mixed results of the gross profit margin, SEED's net profit margin of -152.30% significantly underperformed when compared to the industry average. SEED, with its decline in revenue, slightly underperformed the industry average of 0.7%. Since the same quarter one year prior, revenues slightly dropped by 7.6%. The declining revenue appears to have seeped down to the company's bottom line, decreasing earnings per share.